Yesterday, 2 pieces of paper have appeared in my mailbox in the USA. From what I understand, it is a traffic ticket, from Germany from Summer trip, which found its way to my address in the USA. I do not recollect any violations, however the license plate number looks legit; Date and time look legit as well. The image of the driver is, however, too blurry to recognize. Does the traffic ticket look legitimate? 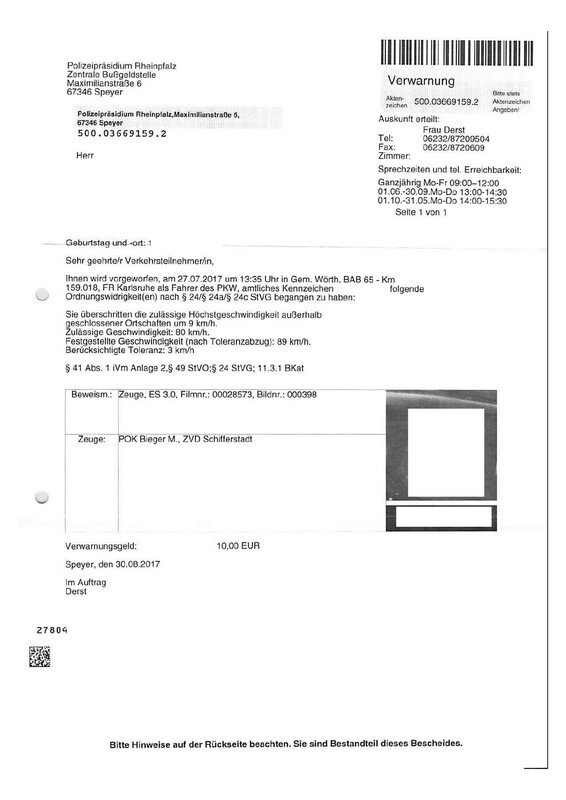 I was not able to find an image of German traffic tickets online. I would like to be a good guest, and pay it. What are my options? Wire transfer is $50, for a EUR10 fee this is ridiculous. 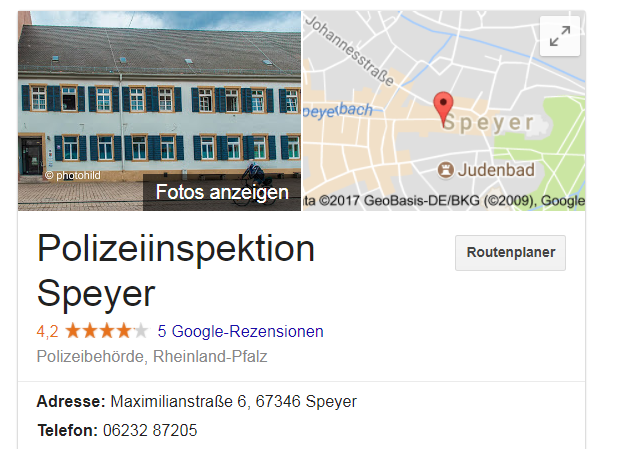 I was able to locate this site: https://www.germantrafficticket.com/ Is it legit? The letter does look like a German traffic ticket and claims to be issued by the competent authority. If time and location (Autobahn 65 between Ludwigshafen and Karlsruhe) are plausible, I would accept it as legitimate. Unfortunately, the state treasury doesn’t seem to publish its bank account number on its website for verification; therefore, in theory, an elaborate scammer who learned of the details of your trip might have created a realistic ticket and just placed his own account number there, but that doesn’t seem likely. The ticket is for speeding: You drove 89 km/h where there was a speed limit of 80 km/h (on an Autobahn, that most likely means there was construction work going on, or you were approaching an area with construction work). This is treated as a relatively minor infraction (Ordnungswidrigkeit), for which the statute of limitations is at most six months. Since the ticket can’t be enforced while you are in the US (assuming you don’t own anything in Germany), you could simply ignore it. In that case, you will probably get another letter (a Bußgeldbescheid) claiming a higher amount such as € 30 and possibly a reminder. On January 28 (at the latest) the issue will be moot. You can try and pay. As you found out, international wire transfer is very expensive; still, the state treasury definitely won’t accept checks nor Paypal nor Bitcoin. You could ask a friend in the EU to make the payment on your behalf. This is also the service offered by the company whose website you found: They will take your money via Paypal, then forward it. Their service fee isn’t particularly cheap, though ($ 20). As a middle ground, if you don’t have a European friend who will pay without charging you a sizeable fee but want to be nicer than just ignoring the matter, you could write to the police and explain that you would be willing to pay the fine, but that the cost for doing so is disproportionate. (You can find the email address on their website. Don’t forget to include the Aktenzeichen.) Since they know the ticket is unenforceable anyway, they are likely to leave it at that. that is how speed tickets are emitted Germany, with a camera and you get the fine ticket per mail weeks later. What are my options? Wire transfer is $50, for a EUR10 fee this is ridiculous. I would write exactly that in an email.. or make a phone call to them and explain that... they are willing to help you!! I contacted them and explained the situation, but they refused to budge. "being in the wrong country is your problem, not ours"
In the end I found someone in the EU, who paid it on my behalf. The other alternative is to use a money transfer service like http://www.xe.com/xemoneytransfer/us/ or https://global.moneycorp.com/usa/. Their fees are a lot less than banks, but it's certainly a hassle as well. I've used both successfully but terms and conditions change rapidly so I would re-evaluate. Find a SEPA slip to pay the ticket fee to get the bank account details, use a inexpensive international wire transfer service like TransferWire (I have links to others below) to send the money via the internet from your bank account or a credit card. I visited Germany this last summer (Aug 2018) and managed to get a speeding ticket driving through a small town outside Berlin. After arriving back home in the states, I started receiving letters in the mail notifying me of the infraction with a website I could go to for an online hearing or to pay the fine. Unfortunately, the website only provided means of paying via bank transfer from within banks in Germany or within the EU. No US option at all. However, the website's payment options included a partially completed SEPA slip, much like the one you've included in the photo above: the wide form with the yellow & white background and red borders. 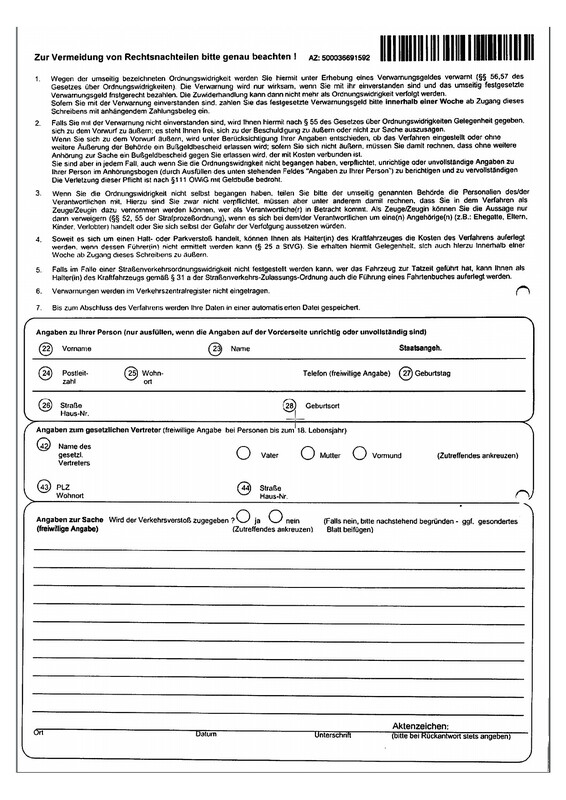 This form should have all the details you need to kick off an international wire transfer. Unfortunately, my bank (Ally Bank) doesn't currently offer international wire transfers (and domestic ones cost $20, yuck!). The good news is that there are lots of businesses on the internet that specialize in precisely this! Nerd Wallet recently wrote a very good article on several of the services that are available ( https://www.nerdwallet.com/blog/banking/best-ways-to-wire-money-internationally/ ). I ultimately chose to go with TransferWire. The sign-up process was painless, I was able to pay via Credit Card, currency conversion rates were covered in the transfer. Fees came to about $4, and could have been lowered more if I transferred directly from my bank account. 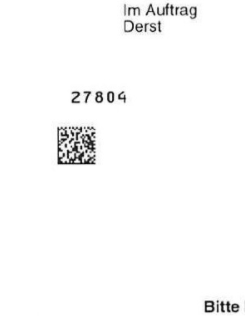 Compte beneficiaire (IBAN): this is the bank account number. It should look something like "DE12345678901234567890". BIC beneficiaire: this is the routing number. It should look something like "WELADED1PMB". TransferWire didn't need this; they were able to look up the appropriate bank by the account number alone. Address: I had to poke around the online traffic infraction website to come up with an appropriate mailing address. I'm pretty sure I got this right. Communication / Reference: this is the speeding ticket reference number. Don't forget to add this to the wire transfer! If you don't, the recipient won't know which ticket the money is for. And that's about it. It took me about a hour of looking around online at threads just like this one to figure out how to pay the ticket. Once I knew what I was doing, knocking out the payment took about 5 minutes. 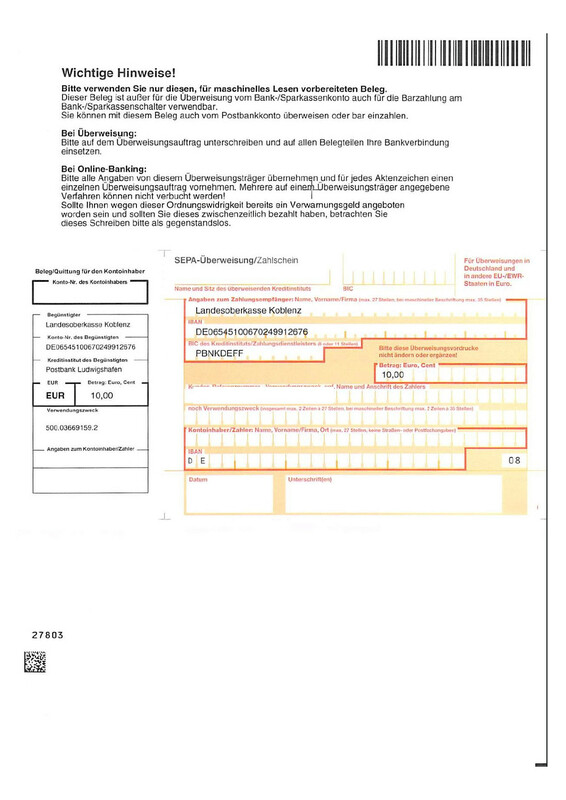 I recently received a letter from Europcar informing me of a traffic violation incurred in Rastatt while driving their rental car, they were obliged by German law to supply my name and address information to German law enforcement. Presumably I will be receiving a similar violation from Germany as the one you have shown. To avoid legal disadvantages please note carefully! Due to the misdemeanor, you will be cautioned and charged with a fine (56.56 dfes of administrative offenses). The warning will only take effect if you agree with it and pay the warning amount on the other side in due time. The infringement can then no longer be prosecuted as an administrative offense. If you agree with the caution, please pay the stipulated caution money within one week of receipt of this letter with attached payment receipt. If you disagree with the warning, you are hereby given the opportunity, pursuant to § 55 of the Code of Administrative Offenses, to comment on the allegation; It is up to you to comment or not to testify. If you comment on the allegation, you will be judged on the basis of your information, whether the procedure will be adjudicated or issued without further statement by the authorities, a fine with costs is connected. In any case, even if you have not committed the misdemeanor, you are obliged to correct and complete any incorrect or incomplete information about yourself by means of a questionnaire (by filling in the box below "Personal Information"). The breach of this duty is threatened with fine by 111 OWiG. If you have not committed the offense yourself, please inform the authority mentioned overleaf of the person responsible. Although you are not required to do so, you must expect, among other things, that you can be seen as a witness in the procedure as to who is responsible. As a witness, you can only deny the statement (52, 55 of the Code of Criminal Procedure) if the person responsible is a dependent (eg, spouse, elders, children, fiancé) and exposes himself to danger of persecution were suspend. As far as it concerns a halt or a parking offense, you as a holder of the motor vehicle, the costs of the procedure can be imposed if the driver can not be determined (25 a StVG). You will be given the opportunity to volunteer within a week of receiving this letter. If, in the event of an irregular road traffic offense, it is not possible to ascertain who was driving the vehicle at the time of the offense, the holder of the motor vehicle may also be required to keep a logbook in accordance with 31a of the Road Traffic Licensing Regulations. Warnings are not registered in the Central Vehicle Register. Until the procedure is completed, your data will be stored in an automated file. Information on the legal representative (voluntary information for persons up to the age of 18) Name of the law. Representative / Father-Mother-Guardian (check as appropriate) Postcode / City / Street / House No. Well, I see no difference between your case and mine, some traffic violation occurred, and local authorities in some German city will be expecting payment. I can only hope this does not affect my ability to drive in Germany in future years. The letter from Europcar did not seem to preclude the possibility of renting from them again, and as someone else mentioned in their answer, it seems that the statue of limitations on minor violations is very short indeed. Hope this helps somebody else in the future! Not the answer you're looking for? Browse other questions tagged germany regulations officials or ask your own question.